There are very few DIY cleaning recipes that I haven’t tried yet! But somehow I hadn’t made any reusable cleaning cloths, and I really wanted to give them a try. I try to go with natural cleaning products as much as I can because not only is cutting out chemicals safer for you and your family, but they are also cheaper and can be customized to create any scent combination you like! 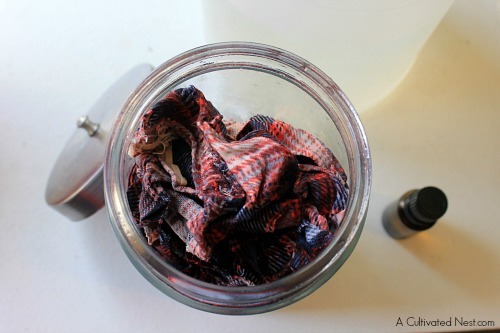 This recipe is extra frugal because instead of using paper towels you can reuse washcloths or fabric rags over and over to save money, which is kinder to the environment too! This combination sanitizes, deodorizes, and is naturally antibacterial. These Homemade All-Purpose Cleaning Wipes can be used on counters, sinks, floors, appliances, and more! Upcycle by using an old shirt or flannel top that has seen better days. For the essential oils, my favorites ones to use are peppermint and lavender- they leave a fresh and clean scent on all my surfaces. Feel free to adjust the scent strength or to change them out for your own favorite essential oils. 1. Cut flannel into rectangles of your desired size- about 6” x 9” is a great versatile size. 2. 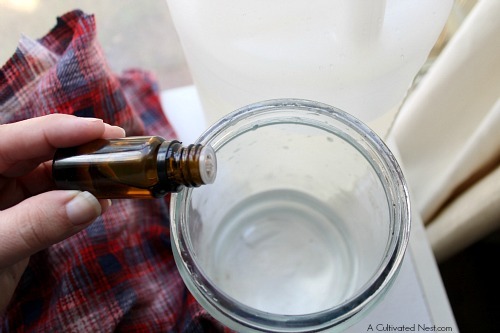 In your jar or canister stir together vinegar, water, and essential oils. 3. Add cloth rags, pressing them down and adding more until all liquid is absorbed. 4. Stir the rags and flip the bottom ones to the top so that all are saturated. 1. Grab one of your all-purpose cleaning wipes ready to go from your jar and wipe down the surface to be cleaned. 2. 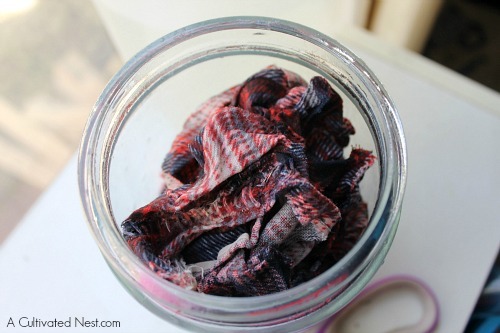 When you are done just toss the rag in the wash. No need to run it through the dryer- just toss damp rags in your jar and start all over again. Do you make your own cleaning supplies? This is a great idea. I never thought to make my own before, but totally want to try this. I love this idea. As a guy, cleaning materials confuse me, so making an all-in-one cleaners sounds simple enough not to frighten me. Now this is such a great idea. Not only a great way to save money, but much better than using those chemicals from store-bought ones. Thanks so much for sharing. 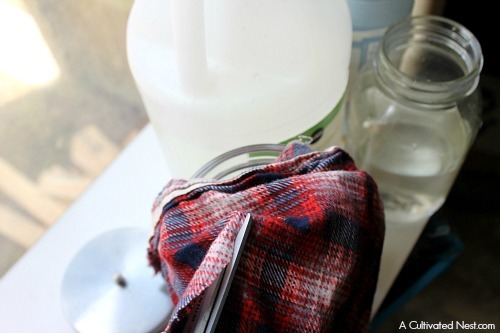 THis is great, I never thought of making my own cleaning wipes! I love using my essential oils to clean with. They make the house smell so good! My toddler loves to help clean (I’m not holding my breath that this trend will last forever). I don’t love the idea of handing her a ton of chemicals, so this is a perfect recipe. I have been looking for better ways to clean my house. I will have to try making these on the weekend. This is an amazing idea. I will have to get the supplies i need to make these. I am always looking for ways to reduce the chemicals in my home. I love making my own cleaners! It’s so nice to know exactly what is in the cleaner you are using. I’ve never made my own cleaning wipes before though. I’ll have to try this! I wouldn’t mind trying this out either. Keeping clean without toxicity is important! Now this is an awesome DIY idea! We go through so many wipes but I also like more natural products like these. I am not very crafty, but this is a great idea I would definitely try! Brilliant! I bet this saves a TON of money. I love the addition of the essential oils, too! What a wonderful idea!! 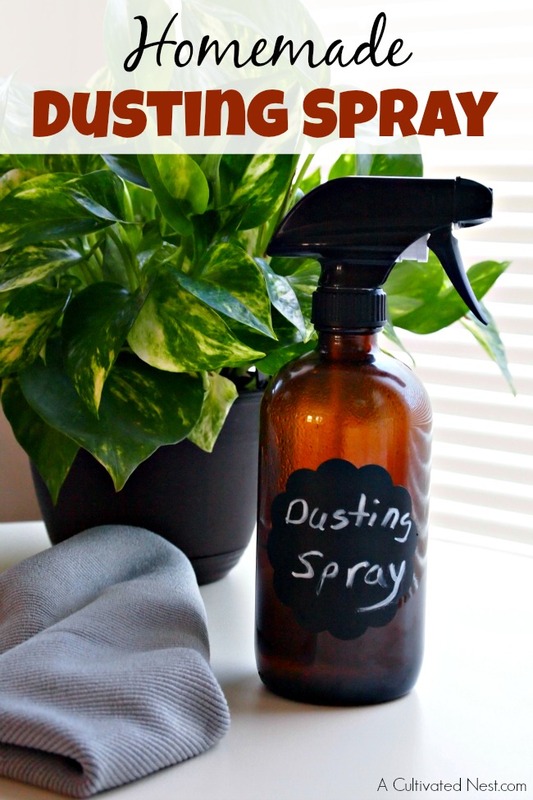 I am always on the lookout for natural cleaning ideas around our house, this is just perfect. Not only is it natural but environmental friendly since your not throwing away disposable wipes. Thanks so much for linking up to Inspire ME Mondays!! What can I use to clean my granite counters. I have heard that vinegar is not good for granite.